Mario Götze is one of the hottest names in football right now. The German player has already accomplished a fair bit during his relatively short career. He is most famously known for scoring the goal which earned Germany the title of World Cup Champions in 2014, after coming off the bench in additional time and scoring the deciding volley. In the process, he became the first ever substitute to score a World Cup winning goal as well as the youngest player to score in a World Cup final. Mario Götze is a player who has the technical abilities and intelligence to play on the flanks, as an attacking midfielder and as a center forward in a false nine type formation. He also possesses fantastic dribbling and play-making abilities, which led to German football legend Franz Beckenbauer dubbing him the “German Messi”. Mario began his career in the Borussia Dortmund youth academy, signing up when he was only eight years old. His talents were recognized by Dortmund coach Jürgen Klopp, who awarded Götze with his professional debut in 2009. Götze soon became integrated into the Borussia Dortmund setup and became a crucial figure in the squad, as well as a fan favorite due to his flamboyant style of play. His antics helped Borussia Dortmund reach the Champions League final in 2013, where they faced their formidable rivals, Bayern Munich. Unfortunately, Klopp’s side lost the final 2-1 after Arjen Robben sunk the Dortmund side by scoring the winner in what could only be described as a thrilling match. A few months later, Mario Götze signed for the Dortmund’s rivals Bayern Munich, who had triggered Mario’s release clause of €37 million. The transfer resulted in Mario Götze being named the most expensive German player of all time. Jürgen Klopp later claimed that the player had moved on because he was keen to play under the managerial influence of Pep Guardiola. The transfer proved to be a success as Mario Götze continued his run of back-to-back Bundesliga titles and helping Bayern dominate the entire German league. He has since matured as a player and gained valuable experience after playing with his national side in the 2014 World Cup. It seems now that the German maestro is willing to move on to another club after a not-so-impressive injury struck 2015-16 season with Bayern Munch. There are several possible moves for a player of his caliber, but it seems as though he wants to reunite with his old boss; Jürgen Klopp – the man who pushed Mario to the become the talent he is today. This 2015-16 season hasn’t seen Mario reach his full potential due to injuries faced by the German, and he has only managed to make 9 Bundesliga appearances this campaign. His starting spot is therefore under scrutiny due to the large number of talented players that Bayern Munich host. “My view on Götze is that he had a few injuries which caused him to leave the squad – and he appears to be one of those people who is affected when he’s outside of a normal working group. “I think that’s where a coach needs to lend that emotional support – and I’m not sure that Guardiola did this. I’m not sure Guardiola touched base with him to make sure he wasn’t feeling isolated. “He is a player who can give much more than he has but he could be helped with more emotional support. The words I would have for a player is to keep your chin up. Never let your head get down, keep your spirits up so you come back stronger than you were when the injury happened. With Mario Götze’s contract set to expire in the summer of 2017, as well as the departure of Pep Guardiola to Manchester City, it is increasingly likely that Bayern Munich will want to cash in on the player. “I don’t know any more. Neither he nor his advisor have stated anything publicly. Mario Götze has the skills to make it in almost any club he signs for, given he keeps his fitness. He is a pivotal member of the German national side and proved his quality with his World Cup winner. Mario surely ticks all the necessary boxes for an attacking midfielder. His services would perfectly fit in with clubs such as Manchester United, Chelsea, Manchester City as well as Arsenal, should he decide to ditch interest from Liverpool. Mario Götze would definitely be a target for Chelsea as it seems they would need to rebuild their squad due to their disastrous season. He would play a key play-making role in Chelsea’s attack and may likely create a formidable partnership with the struggling Eden Hazard to help Chelsea back into the top four. Barcelona may also be a possible destination for the German. His abilities would fit well into the Barcelona philosophy as he has worked with the Catalan legend – Pep Guardiola. He would integrate well into the squad, although he may face a challenge to find playing time due to the large number of superstars already in the squad. Manchester United, who have already spent over €300 million on players, may not be a likely destination for the German although Mario may cherish a reunion with former Bayern Munich star and world cup winner Bastian Schweinsteiger. He would most certainly shake things up if he were to arrive, possibly taking over Rooney’s position as a #10. All in all, it seems that if Mario Götze were to change clubs, Liverpool is his most likely destination as he seeks to reunite with Klopp. His price tag and wages may be the only determining factor. A move to the Premier League means that he would join his current manager, Pep, in moving to England. Only time will tell what the German decides next, we can only hope he manages his fitness well. 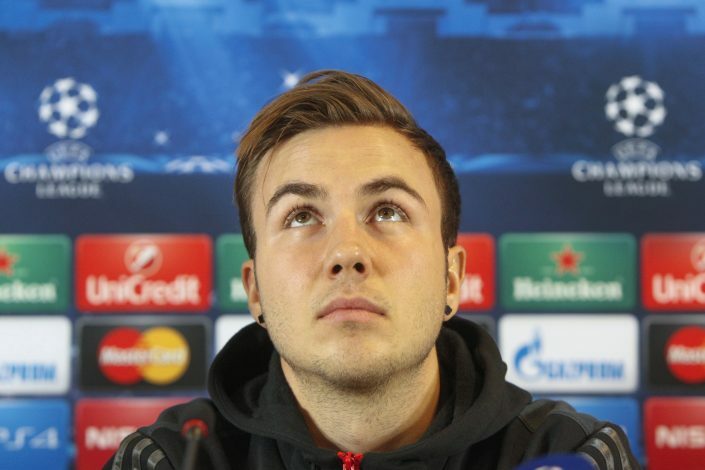 Do you expect Mario Götze to request a transfer away from Bayern Munich or stay at the club?